Here you’ll find the hard facts about emotional abuse explained – and you’ll learn to frame this negative interaction in a new way. 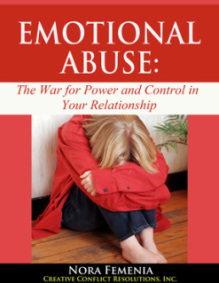 You can finally understand the basics of emotional abuse and emotionally abusive relationships. You’ll learn definitions and explanations of why emotional abuse is used, then analyze your own personal situation for signs of abuse. The book contains multiple small surveys and checklists to help you guide your own thoughts about your personal situation. You might think that emotional abuse is easy to spot or define. But the reason so many people suffer from an emotionally abusive marriage is that it is hard to tell what is abusive and what is not. You have to ask yourself whether or not the person you love is hurting you. This book is part of a new two-part series for how to stop emotional abuse, the book: Breaking Free from Emotional Abuse/ is the second part. Make an special effort to make new friends: at work, at the kids’ school, at church, the salon, the yoga studio – any place where you can say hello, and have a bit of interaction with others. Even if you don’t feel like doing it, you need to remember to make an effort. Remember what you are good at: remember all of your aspects you were proud of. In your mind, go back to the times of school, of college, of your first job, and gather without false shame all the compliments you received. How other people see you, and what were the good qualities they told you that you had? Listen to those voices! You need their support to balance out the poisonous comments of your abuser and all the about “weaknesses” he made so much fun about. Make a picture of yourself: Using clipping from magazines, art books, cards or just drawings, create a collage of images and words that describe “you.” Do you love a certain flower? Is there a city that you’d love to walk the streets of? What about a color or word that makes you smile? Keep it in a private place, or just somewhere that you’re comfortable with. Look at it each day and soak in the things that you love about yourself. You’re looking at an image of your inner self! Learn to see beauty in everyday life: seeing beauty in the world will help uplift your worldview and see yourself as a beautiful participant in a beautiful world. Nature is a good place to start – and if you don’t have any flowers to smell, plant your own! Don’t forget that you need to have a road map for yourself as you move forward into a new and healthier life. You know yourself best, so you can map your own healing/recovery process. It is very important to have this map, so that you always have a plan to refer to and fall back on when you feel your resolve faltering. It is always uplifting to remember who you are, where you’ve been, and where you’re going to go, by looking back on what’s important to you, as written in your life map. We would love to share more tips with you…get the book, when reading it, write down your personal questions and then, ask a free coaching session to talk with us! Here is your link for the free coaching session.